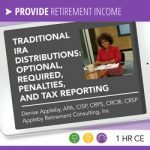 Denise Appleby, APA, CISP, CRPS, CRC®, CRSP, Founder and Owner of Appleby Retirement Consulting, Inc., is adept in all aspects of retirement planning with special expertise in IRA rules, regulations and strategies for mistakes prevention. Denise’s special expertise is her proficiency in and knack for explaining complex retirement plan rules and regulations so that they are easily understood, particularly the intricacies of IRAs. Denise has extensive experience with training the staff and financial advisors of many broker-dealer on retirement plans related topics, creating a demand for her to speak at various conferences and seminars around the country. 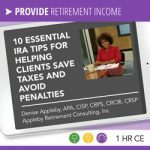 Denise is founder and owner of Appleby Retirement Consulting, Inc, a firm that provides IRA tools and resources for financial and tax professionals. 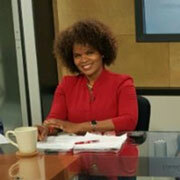 Denise’s wealth of knowledge in retirement plans led to her making appearances on CNBC’s Business News and being quoted in the Wall Street Journal, Investor’s Business Daily, CBS Marketwatch’s Retirement Weekly and other financial publications, where she gave insights on retirement planning. Denise Appleby, Founder, Appleby Retirement Consulting, Inc.
With over fourteen years of experience in the IRA and defined contribution plans fields, Denise held several senior retirement plans related positions with Pershing LLC, which includes Vice President of Retirement Plans Products and Services, Retirement Plans Manager, Trainer, Training Manager, Compliance Consultant, Technical Help Desk Manager and Writer. While with Pershing, Denise served as a member and firm representative of the Security Industry Association’s (SIA) Retirement and Savings Committee and has spoken at their Savings & Retirement Symposium , which is attended by financial services professionals from a variety of fields, including marketing , sales, legal, operations, and strategic planning. As is evidenced by numerous IRS private letter rulings, court cases, and other official sources, mistakes with IRA transactions is a common occurrence. These mistakes can result in loss of tax-deferred status, and penalties being owed to the IRS. This can lead to years of accumulated savings being lost to higher tax rates and penalties, plus the loss of the benefit of tax-deferred growth. Gain ideas for helping clients take their traditional IRA required Minimum Distributions (RMDs) on time – and avoid penalties. Distributions from IRAs are usually considered ordinary income and as such, may be subject to income tax. 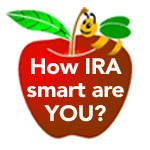 In some cases, amounts may also be subject to the 10 percent early distribution penalty, if the amount is withdrawn before the IRA owner reaches age 59 ½ . However, there are exceptions. Mistakes, including missing critical deadlines, can result in avoidable penalties and missed opportunities for your clients. Gain new insights and important reminders about how to help clients, employees, family and friends protect their retirement savings from avoidable penalties. This session is designed to help retirement professionals get a head start with identifying and understanding the transactions that are required to be completed by the end of the year for tax and distribution planning, as well as for compliance purposes. View short clips of some of Denise Appleby’s presentations on our Retirement Resource Center YouTube Channel. – Roth IRA Answer Book, Published by Aspen Publishers. TheRoth IRA Answer Book, Sixth Edition, provides an up-to-the-minute tutorial on this subject for a wide variety of professional markets, including pension consultants, insurance agents, financial planners and investment advisors, plan administrators, lawyers, and accountants, as well as businesses that promote, market, service, or provide technical support to retirement plans, products, and related services. 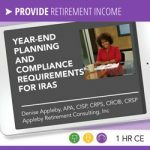 – Quick Reference to IRAs,Published by Aspen Publishers. TheQuickReference to IRAsprovides attorneys, accountants, financial planners, and consultants – along with their clients – with the essential facts and advice regarding the planning, implementation, and administration of IRAs. – Adviser’s Guide to Retirement Plans for Small Businesses, Published byAICPA. The Adviser’s Guide to Retirement Plans for Small Businesses is designed to provide you with the knowledge and tools you need to offer strategic advice about retirement plans. In 30 chapters, you’ll find discussion of statutory requirements, the legal structure of various plan types, as well as detailed information on plan design, establishment, monitoring, administration, correction of failures, and termination. Denise is also an editor, providing technical editing services for books, newsletters , articles and other material on retirement plans and retirement planning. Books edited by Denise includes Quick Reference to IRAs by Gary lesser and Don Levy-2003; SIMPLE, SEP and SARSEP Answer Book by Gary Lesser and Susan Diehl Ninth Edition, “Parlay Your IRA Into a Family Fortune” (Viking; 2005) by Ed Slott. Denise received several recognition awards for outstanding job-related performances, including Pershing’s Leadership Awards for significant contribution to the development of system rules engine and policies & procedures for changes effected by new tax laws and the Outstanding Representative Award from New York Metropolitan Society of Consumer Affairs Professionals. How can you have Denise Appleby speak at your event? Denise Appleby, APA, CISP, CRPS, CRC®, CRSP, is an experienced speaker and presenter with a passion for providing industry-leading information to audiences. She is available to speak at your retirement meeting, conference or event. Inquire here about having Denise Appleby speak at your conference or event! Or learn more about other Retirement Speakers Bureau presenters to find the one that’s best for you.